Download the Printable Sample PDF! In the this file you will find 12 printable cards. One card from 12 unique vectors. 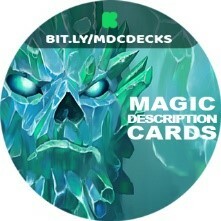 In addtions you will find the card artwork that you can use to print your own cards for personal use. 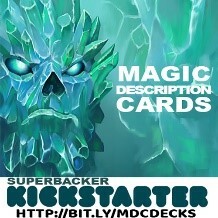 There is also a blank card template for you to potential create Magic Desription Cards on your own. 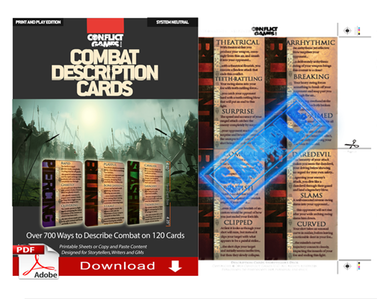 Conflict's Magic Description Cards will make every spell count. 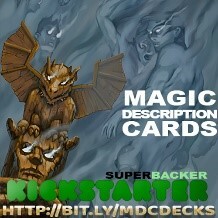 100 cards, each with its own set of exciting Magic depictions, ready to detail each spell cast! 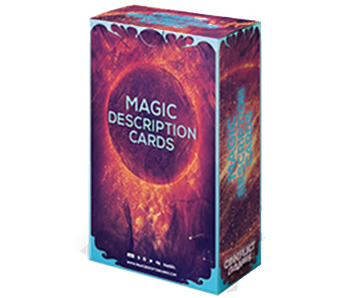 Or craft your own memorable Magic descriptions using the Action Words provided on each card! No need to repeat yourself ever again! 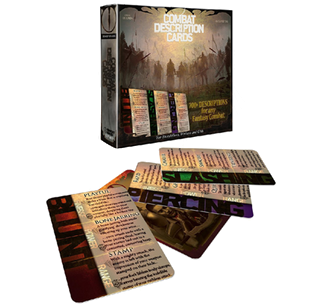 Every card has a set of unique Action Words and every Action Word has its own unique, thrilling Magic description. That's six hundred colorful Magic descriptions, ready to be dropped into any battle. 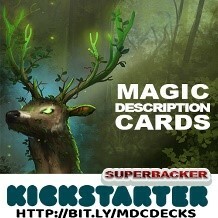 The initial Kickstarter offering is a deck of over 100 cards with creative ways to describe in-combat magic. The cards work by having a ready list of three adjectives, each with two example phrases of how to use them. 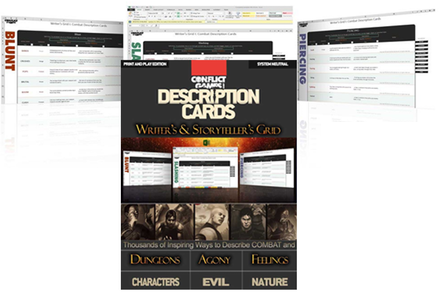 Card users are encouraged to practice using the adjectives to spark their imaginations when describing in-combat magic during tabletop roleplaying games or while writing the next best-seller. 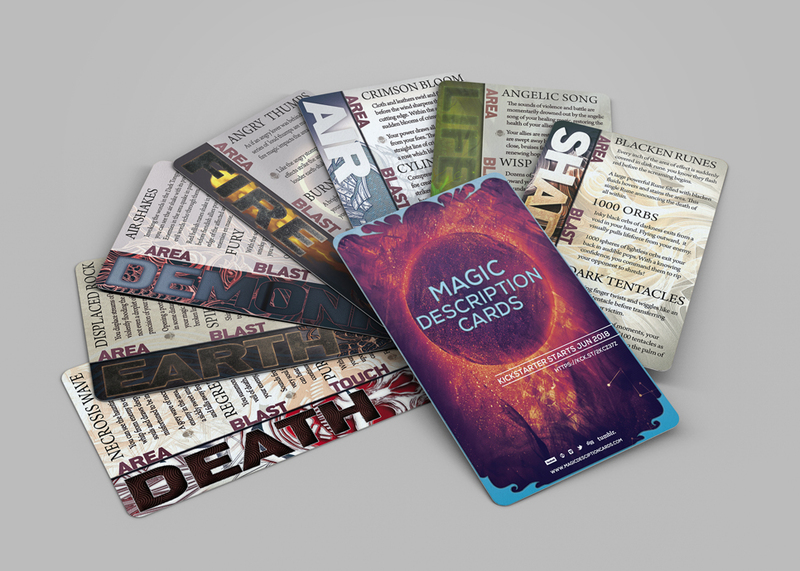 There are epic finale death-depictions written right on the cards; users can also group and stack cards to formulate more dramatic depictions as they see fit. 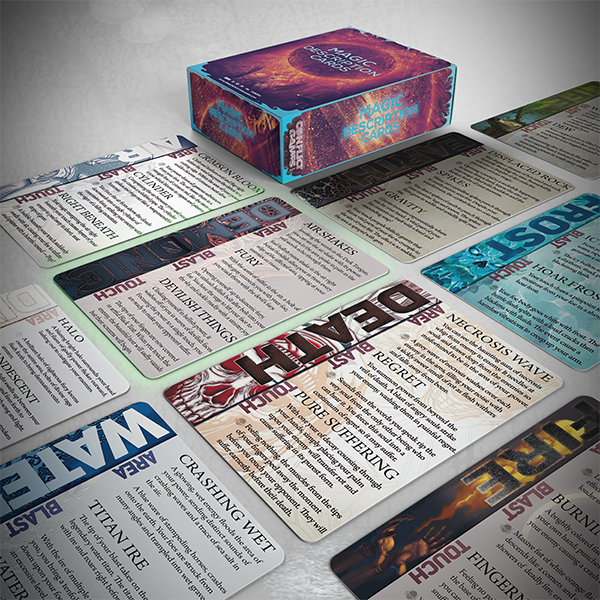 The illustrative examples on the card can be read aloud during tabletop roleplaying sessions or consulted to break the dreaded writer’s block. 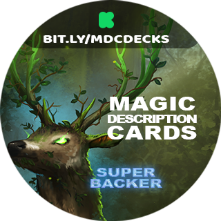 With this simple but elegant design, you can find the Magic description you're looking for the very moment you pick up a card! 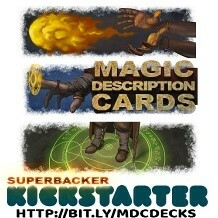 ALL CARDS + ALL DIGITAL pledge level! cards + "SEND ME EVERYTHING!" pledge level! • Go to the Magic DESCRIPTION CARDS Kickstarter page and press the Manage Your Pledge Button. If you have not pledged yet it will say Back this Project. • Increase your pledge in the Pledge Amount box by the total of the add-ons you want to add. Do not change the tier you are currently pledged at, unless you also want to change it while you are on this screen. You will then need to add the total of your add-ons onto the amount of the new tier you chose. • After the end of the Kickstarter campaign you will receive a survey that will ask you questions so that you can explain how you would like the add-on money assigned, the size of tee-shirts, and customizations when applicable. Add one additional Magic Description Card (MDC) deck to your rewards. 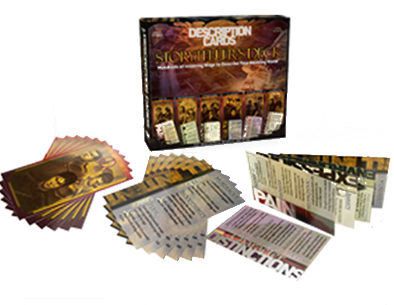 Add one additional Storyteller's Deck (STC) to your rewards This 80-card deck is filled with inspiring ways to depict he delicate nuances of your world. Broken down into 6 card sets, ranging from depitions of Pain, Labyrinths, Villains, Expressions, Vistas and Character Distinctions. Add one additional Writer's & GM Screen PDF to your rewards. A beautiful 4-panel screen which surrounds you with inspiration and memorable descriptions, synonyms and results of combat strikes. 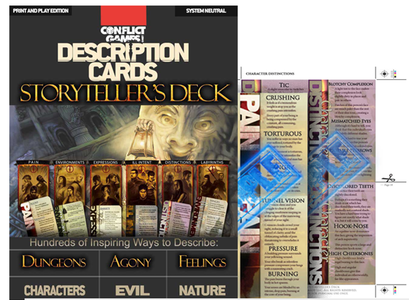 Plus, additional depictions from the Description Cards Storytelling Deck. Over 130 phrases in total. 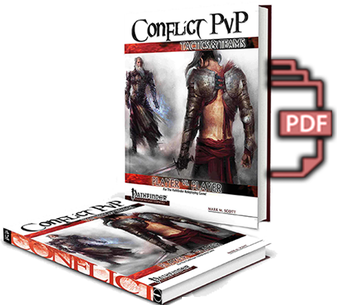 Add one Conflict PvP: Tactics and Trems Rulebook PDF to your rewards. It's advanced team vs. team mechanics and rules for the Pathfinder RPG. Matches are driven by scenarios with clear objectives that must be completed to win. Also organized lists of plot hooks, magic items, artifacts, rule adjustments, fir your existing campaign. 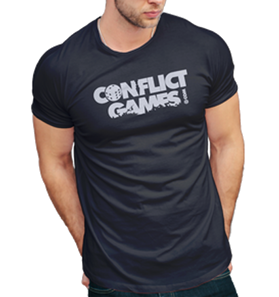 Add one Conflict Games XL T-Shirt to your rewards. A little swag merch from Conflict Games. Comes in Black and only in XL sizes. 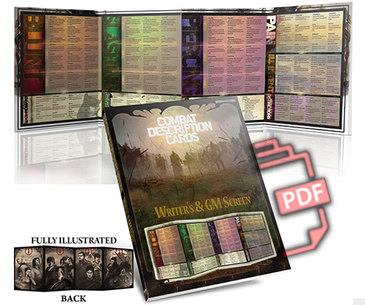 Add one Storyteller's Deck Print-n-Play PDF to your rewards. Print ready PDF of the Storyteller's Deck. 80 cards. Delivered Posted kickstarter Campaign. Add your own name or character's name to the bottm of a Magic Description Card. This can be purchased multiple times. 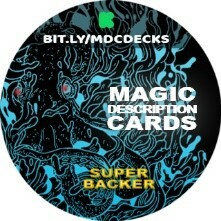 Badges have an infectious quality that makes them perfect to raise awareness of a Kickstarter campaign. Spread the word for by using these badges for your social media profile picture. 1. Can I change my pledge multiple times? Yes! You can change your pledge as many times as you like during the campaign to make sure you get everything you want. 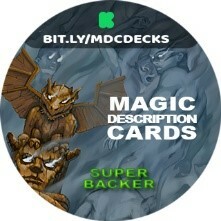 Kickstarter will not charge your card until after the Kickstarter ends. 2. When is my card charged? Amazon begins processing your cards immediately after the Kickstarter ends. 3. What if my card is declined? Amazon will give you 14 days after the close of the Kickstarter to clear up any payment problems with your card, or to provide alternate payment information. 4. How do I find out more about the Retailer Bundle? 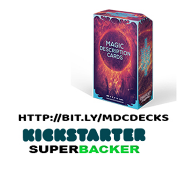 Simply message us through Kickstarter using the link at the top of the Kickstarter page, and we'll put you in touch with our trade team who can run through what's available and how to pledge! 5. When Does Magic Descriptions Cards Release? There’s no hard release date; however, we expect the cards to be shipping in the 1st quarter of next year, 2019 (or sooner). 6. How Do I Get Updates on the Cards’ Status? Easy! And convenient! 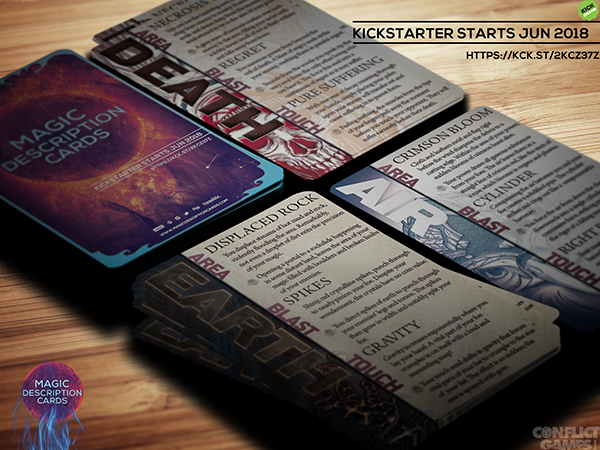 We will regularly provide updates on our Kickstarter page and on our forums. 7. Specifically, What RPG Games or Projects Have You Guys Worked On? Team members have worked on the following games, accessories and projects. 8. When Do I Get My Rewards? 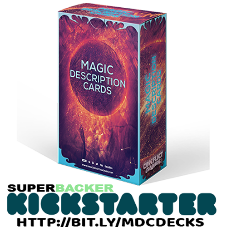 The Magic Descriptions Cards has no hard release date; however, we expect the cards to be shipping in the 1st quarter of next year (2019) or sooner for both digital and physical rewards. However, if we can ship the digital rewards out sooner, we will, we promise. 9. Can we pay by Paypal on the Kickstarter? Kickstarter does not support Paypal directly. For your convenience, we do offer a Paypal solution directly on our website. In anycase, if you have a credit card, we encourage you to support us directly on KickStarter. 10. Will you support any other languages? Nope. Unfortunately this project will be done in English only. 11. I've moved and/or my shipping address has changed since I gave it to you. How will I get my rewards? How can I change my address? If you moved or need to change your address for future rewards, we can help. Please contact us to give us your new address. However, even if you give us your new address, you should still set up mail forwarding with your local post office. 12. I'm using a new email address. How do I change the one I gave you? If you'd like to change the email address we use for contacting you about rewards, please contact us. You will need to provide your original email address, and the new email address that you would like to use going forward. However, if you want to change the email address where you receive Backer Updates and other Kickstarter messages, you'll need to do that yourself, by logging into Kickstarter. (We would help, but we don't have permission to do it for you!) Just log into Kickstarter and go to the Settings page. You can change your email address from there. 13. 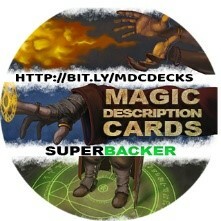 I am not a backer, but can I purchase any of the Kickstarter Rewards? Yes, but some rewards are only available exclusively during the Kickstarter campaign. For those please click the paypal option above, in the "add-on" section or Please visit the Conflict Books store to purchase our stuff! 14. Where are the utility spells? While there are a lot of spells out there, we wanted to focus the main thrust of the product, so that it can have the most impact for players and GMs will be damaging spells. 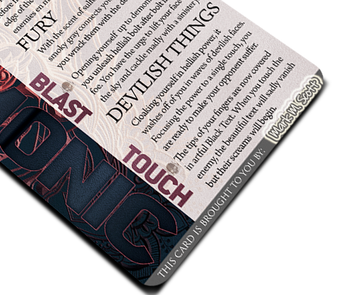 But fear not, cards for those kinds of spells may very well be stretch goals for this campaign. 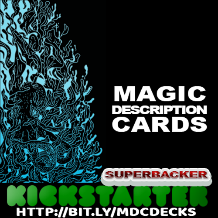 Magic Description Cards © 2018 by Conflict Games LLC. All rights reserved.